In typical Aaron Craft fashion the Ohio State point guard didn't attempt a field goal but still had a positive impact on the game. He moved the ball on offense, got into the lane with hesitation moves from the perimeter, and defended his position. Craft's shooting mechanics leave much to be desired, however, as he's a long way from being any type of threat from NBA 3-point range. Craft's defense is exceptional, but serious questions remain about whether he's enough of a scoring threat to get on the floor in the NBA and not be a liability. 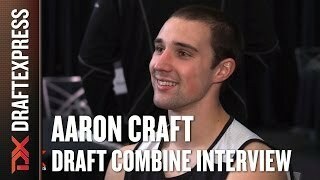 Heading toward the start of his senior season, there's very little that has not already been said about Aaron Craft. Over the last three seasons, or seven if you include his career at Liberty Benton HS (OH) and the 221-9 record he amassed playing for All-Ohio Red on the AAU circuit, the two-time CoSIDA Academic All-American has earned a well-deserved reputation for defense, hustle, and the type of heady point guard play and gamesmanship one would expect from a coach's son. Similarly, our scouting reports on Craft have remained equally steady over time, as his strengths and weaknesses as a prospect are well-documented and haven't changed much since he emerged on the college scene. A strong point guard with good size and lateral quickness, Craft is among the best perimeter defenders the college game has had to offer in recent memory. His non-stop motor and all-around game make him a disruptive force and help him make plays that don't show up in the box score. On the offensive end, he is a steady ball-handler who does a good job handling pressure and distributing the ball in transition and on the pick and roll. An extremely unselfish, pass-first point guard, he seldom forces the issue, but will take what the defense gives him off the dribble. He lacks great length and leaping ability, but still finished at a 62% rate around the basket last season according to Synergy Sports Technology. The biggest question-mark about Craft from a NBA perspective has and continues to be whether he can keep defenders honest with his perimeter shot. Looking at statistics alone, one could assume last season was a struggle for Craft on the offensive end on the whole, his productivity increased marginally as he averaged double figures for the first time but shot career lows of 42% from the field and 30% from beyond the arc. For stretches, there was certainly some truth to that, it was a challenge for him to be the consistent secondary offensive weapon Thad Matta's team needed early on. The primary ball-handler on a team that lacked a consistent high-level scoring threat aside from DeShaun Thomas until LaQuinton Ross emerged late in the year, the onus was on Craft, and his often-criticized jump shot, to play out of character and look for his own offense on the nights his team struggled to score. Though he finished the year making just 32% of his jump shots off the dribble and off the catch alike, Craft delivered when it mattered. After a blowout loss to Wisconsin in February, things began to click for him, as he made 32% of his three pointers including one to sink Iowa State in the Sweet 16 as time expire, shot a much more characteristic 48% from the field, and averaged 11.8 points over the team's last 12 games. Couple that uptick in offensive efficiency with all the other positive things he does on the floor, and it is no surprise that he was ultimately named All-Big Ten 1st team by the media and was the MVP of the Big Ten Tournament. Heading into his last season of eligibility, Craft could once again face additional pressure to score with Thomas out of the picture unless Ohio State's deep junior class picks up that slack. Regardless, he'll have ample opportunity to show what progress he's made as a shooter. Even if he doesn't show marked improvement, he'll still get plenty of looks, as coaches love players who do their job consistently the way he does. Eric Snow and Kevin Ollie both played 10+ seasons in the NBA thanks to their size, defense, and intangibles. Neither even became a very reliable threat from outside in that time. Point guards in their mold fit in particular situations better than others, and different teams will certainly have different views on Craft depending on their personnel. If he can improve his consistency away from the rim, there's no doubt he'll broaden his appeal and improve his draft stock. Aaron Craft was not considered a blue-chip recruit coming out of high school, but earned national attention for his inspired play as a freshman for the 34-3 Ohio State Buckeyes. Winning the Big Ten Sixth Man of the Year Award and being named to the All-Big Ten Defensive Team, the Findlay, Ohio native was the consummate glue guy for Head Coach Thad Matta. Despite the praise Craft received for his hustle and defense, it is important to remember that he was playing in a very small niche offensively. Though he could not have meshed better with the veterans on OSU's roster, he did rank among the least prolific per-40 minute pace adjust scorers in our database, attempting the second fewest field goal attempts per-minute, which is a limiting factor on the depth with which we can evaluate his NBA potential at this time. When delving into what we can definitely say about Craft at this point, analyzing his somewhat unique physical profile is not a bad place to start. Built somewhere in between a Big Ten football player and a point guard, Craft has adequate size and good strength for his position, but it is his lateral speed that really stands out among his peers. Craft moves his feet exceptionally well on the defensive end, and uses his ability to stop and start on a dime to handle full court pressure like a seasoned veteran on offense. It was Craft's agility that made him one of the peskiest defenders in all of college basketball last year. Ranking among the top players in our database in steals per-40 minutes pace adjusted, Craft doesn't only keep his man out of the lane and apply pressure, he uses his quick hands to create turnovers, stays with plays even when he's beat, steps in front of much bigger players to take charges, won't hesitate to get on the floor to scrap for loose balls, and managed to take some of the NCAA's best scorers out of their comfort zones with his intensity. Though his size and average explosiveness limit his ability to contest shots at times, Craft seems to have the burst that many players in this no-nonsense, defense-oriented mold have lacked in the past. On top of what Craft offers defensively, he is an extremely efficient passer. The rising sophomore ranked 11th among players in our database in assist-to-turnover ratio, showing a high basketball IQ while making simple plays to set up the experienced group of players around him. A team-first player, Craft seldom forces the issue and is like a coach on the floor. He may not be a dynamic shot-creator at this stage, which limits his upside at the position from a professional standpoint, but he more than got the job done as a true freshman at the collegiate level. As noted above, one area where Craft did not exceed expectations was as a scorer. Part of the reason why he scored under 7 points per-game was because of the talent around him and that he, in his role of set-up man, was not seeking his own shot, but it was also a result of his recognition of his limitations as a slasher. At the rim, Craft took what defenders gave him and finished at a decent rate, but had his shot blocked on occasion and showed a lack of explosive leaping ability that hurts his ability to compete above the rim. Out on the perimeter, Craft knocked down a solid 41% of his jump shots in limited attempts. Moving forward, Craft could definitely stand to improve his shooting consistency. At this juncture, there is no reason to jump to any conclusions about what Craft's NBA outlook may be. He's a probable three or four-year player who has a terrific head on his shoulders, but does not yet have a clearly defined NBA skill, despite his merits defensively. He's an elite role-player in the college game, but as the cast of characters changes around him, Craft's skill level will be tested, at which point his potential NBA prospects will become clearer.